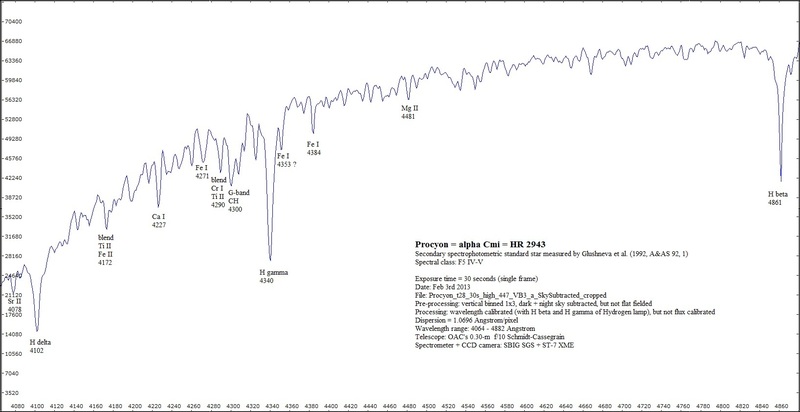 CCD spectrography is a powerful tool for our understanding of the physical and chemical composition of the universe. 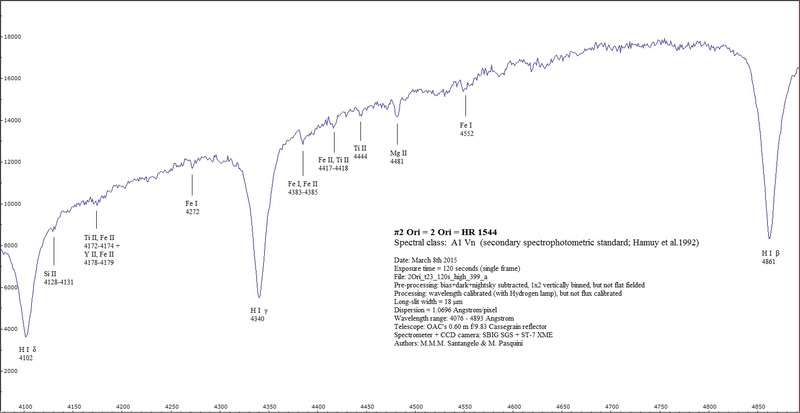 At OAC we are going to realize a library of moderately high dispersion CCD long slit stellar spectra, by means of the SGS spectrometer, at a dispersion of about 1.07Angstrom/pixel. 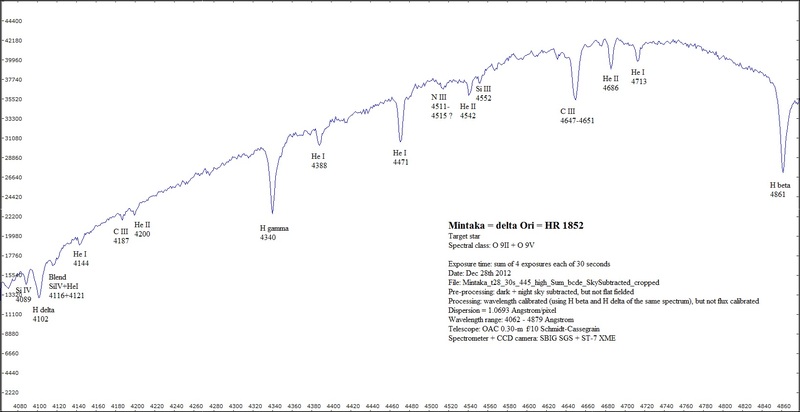 These spectra were taken by OAC's director M.M.M. 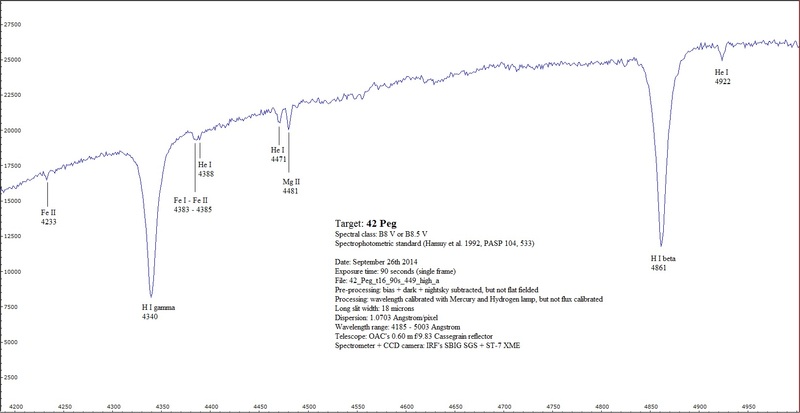 Santangelo, sometimes with the help of his co-workers; one of them is shown below as a frame. 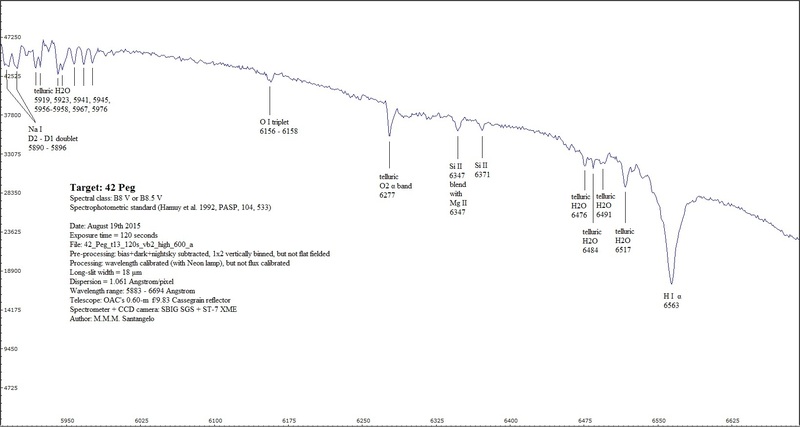 Below we show some tracings of (moderately) high dispersion long-slit CCD spectra of various stars and nebulae recorded at OAC. 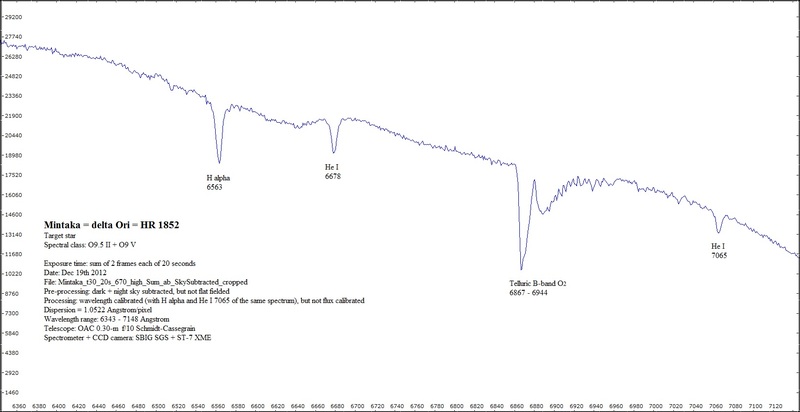 In order to find the proper spectral range (namely the one which we are interested in) with the SGS spectrometer we need to turn properly the small control knob of the vernier which turns the diffraction grating. 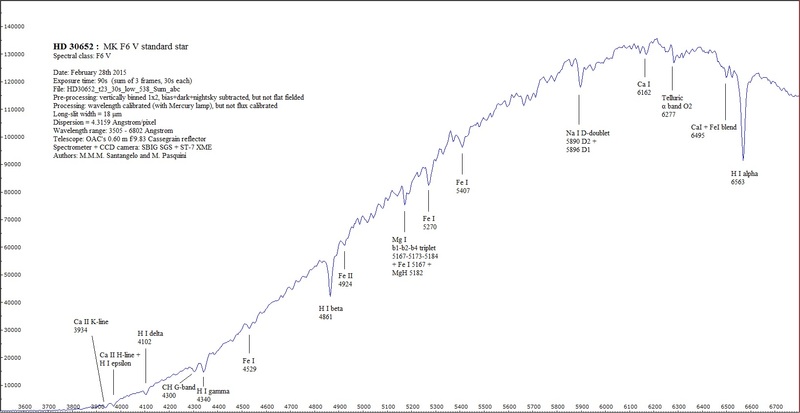 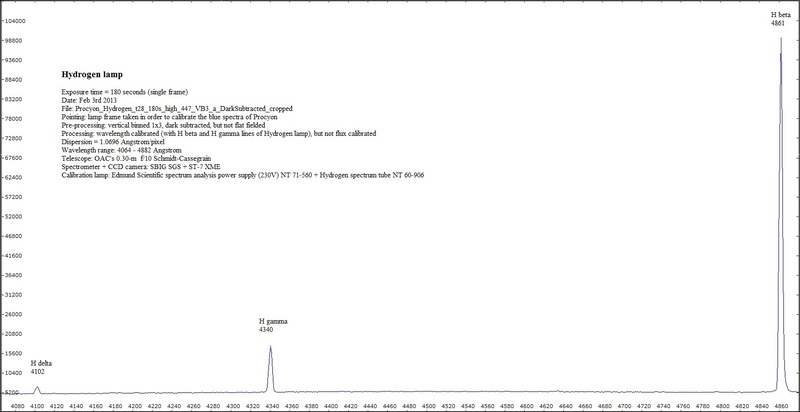 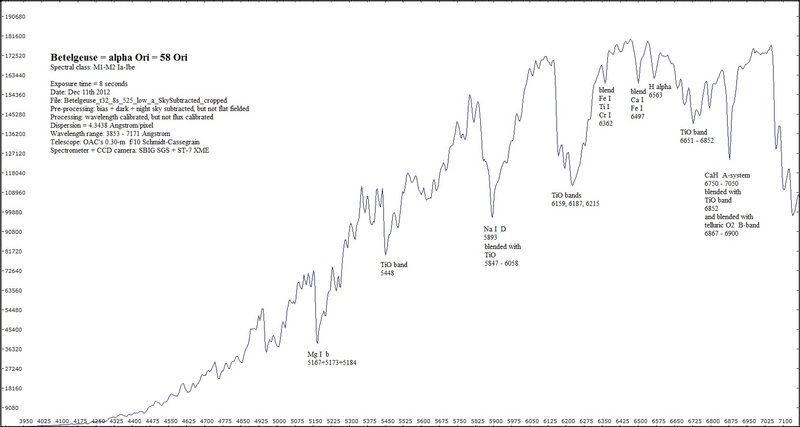 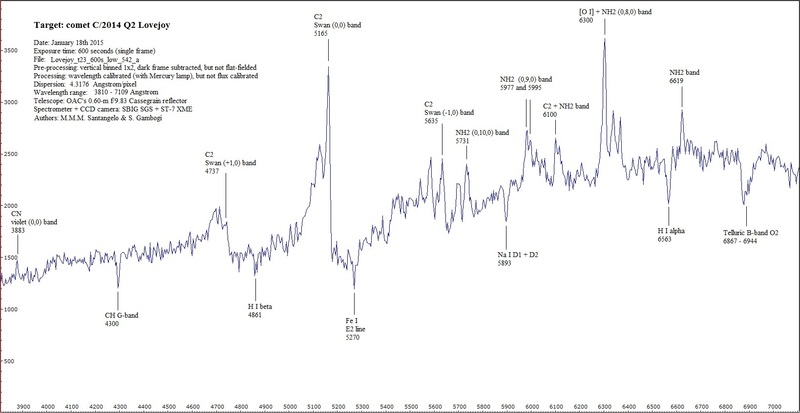 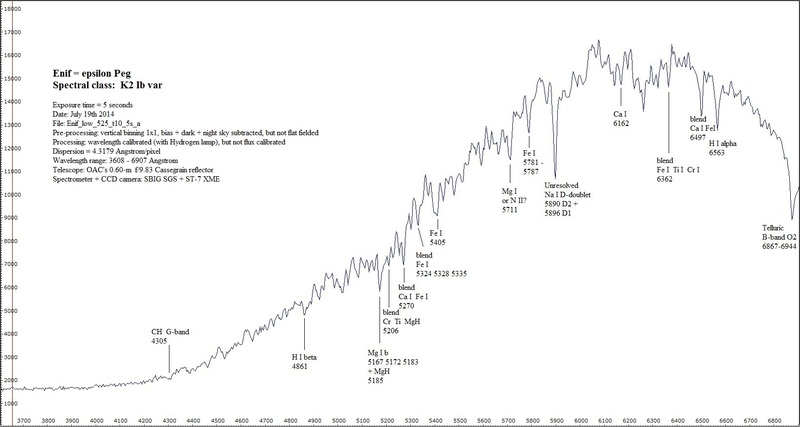 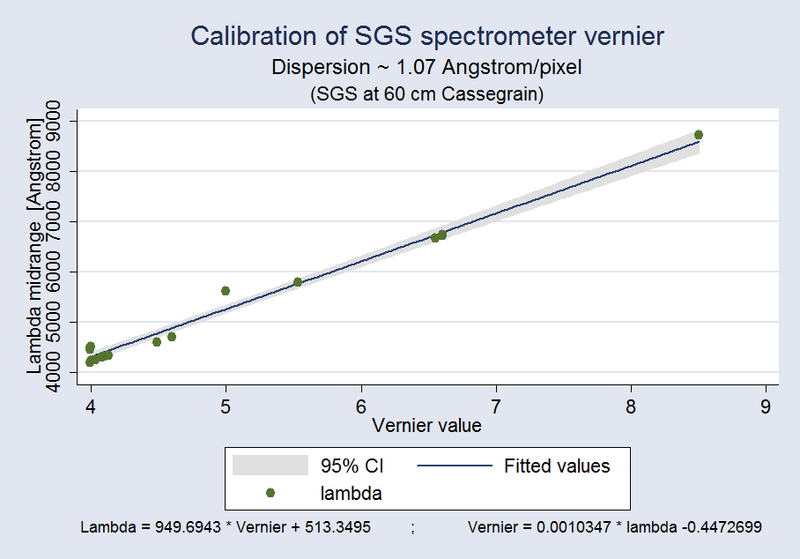 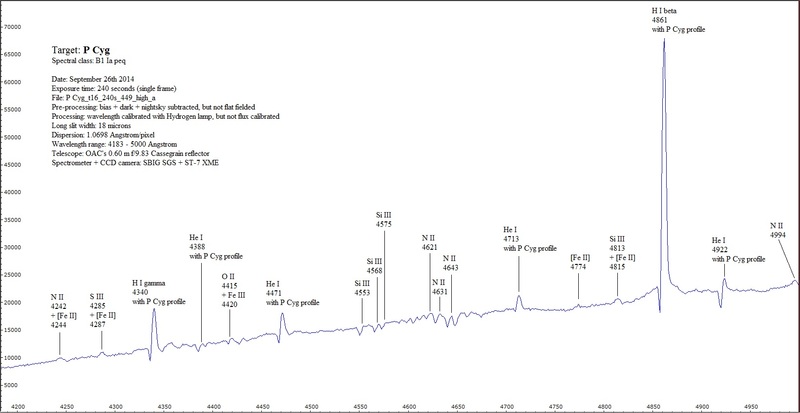 But before doing so we need to make a calibration of the vernier readings vs wavelength, In the following graph you can see such a calibration for the 1.07 Angstrom/pixel dispersion. 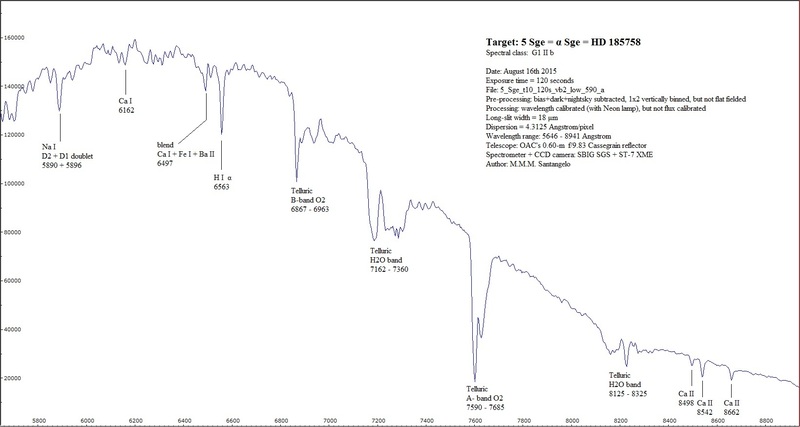 At OAC we are going to realize a library of medium dispersion CCD long slit stellar spectra, by means of the SGS spectrometer, at a dispersion of about 4.3 Angstrom/pixel. 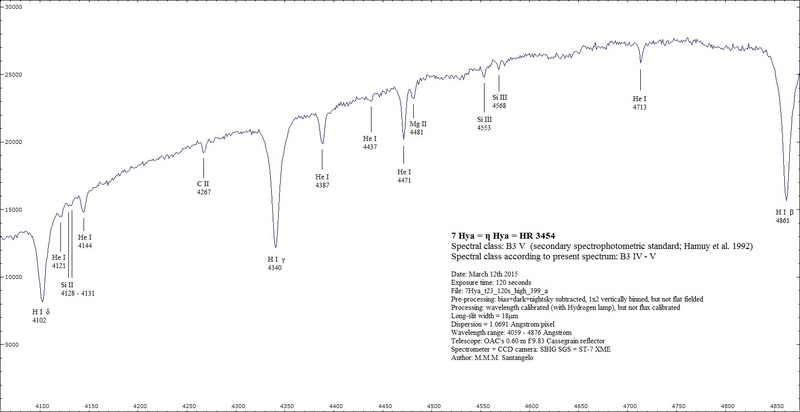 These spectra were taken by OAC's director M.M.M. 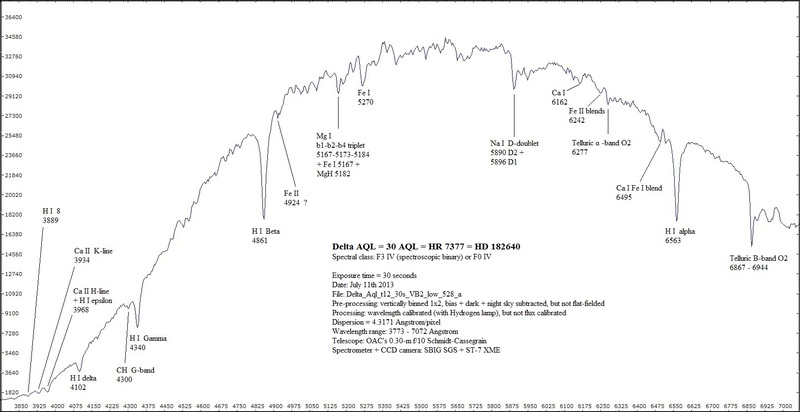 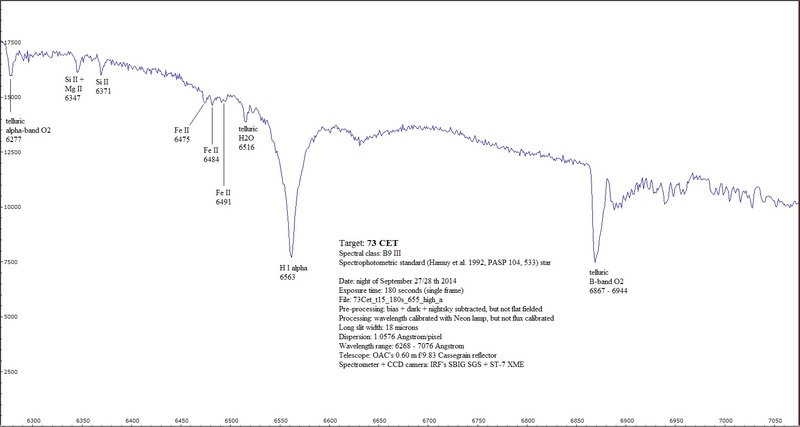 Santangelo, sometimes with the help of his co-workers; some of them (and cometary spectra too) are listed below both as tracings and as frames. 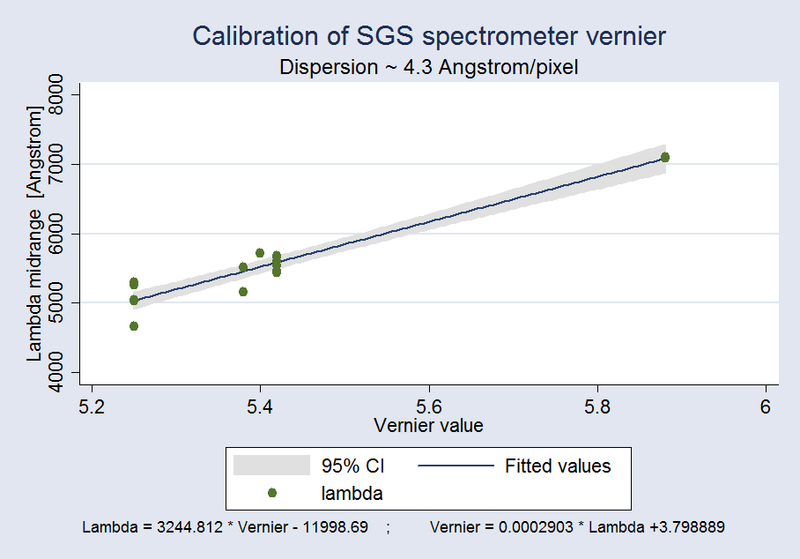 In order to find the proper spectral range (namely the one which we are interested in) with the SGS spectrometer we need to turn properly the small control knob of the vernier which turns the diffraction grating. 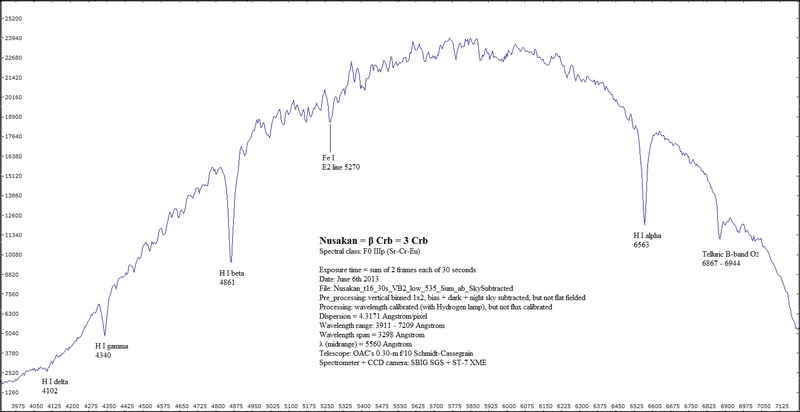 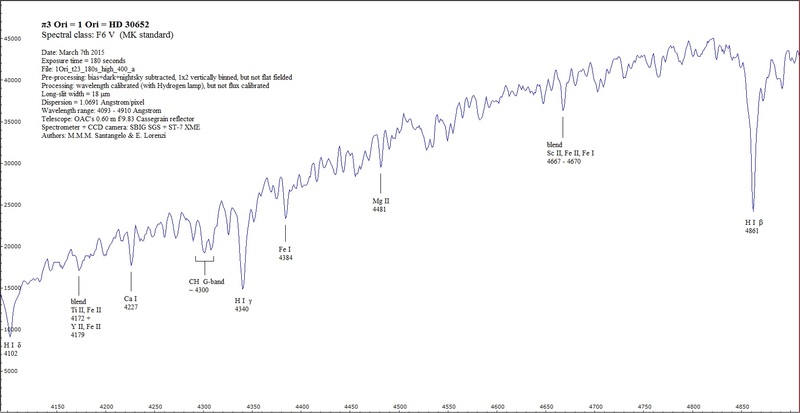 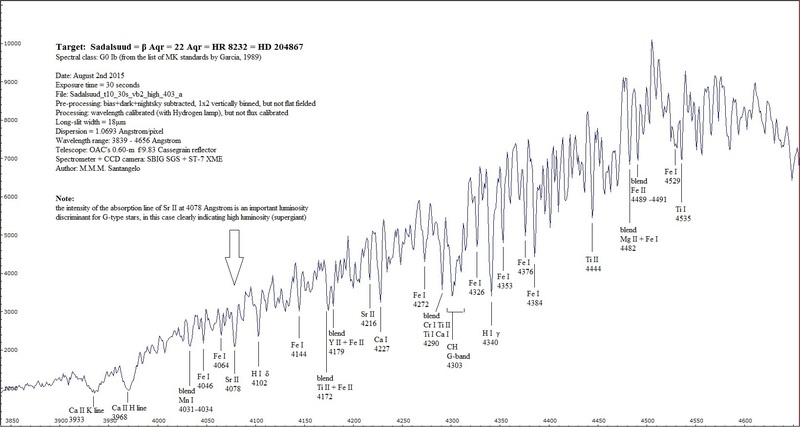 But before doing so we need to make a calibration of the vernier readings vs wavelength, In the following graph you can see such a calibration for the 4.3 Angstrom/pixel dispersion. 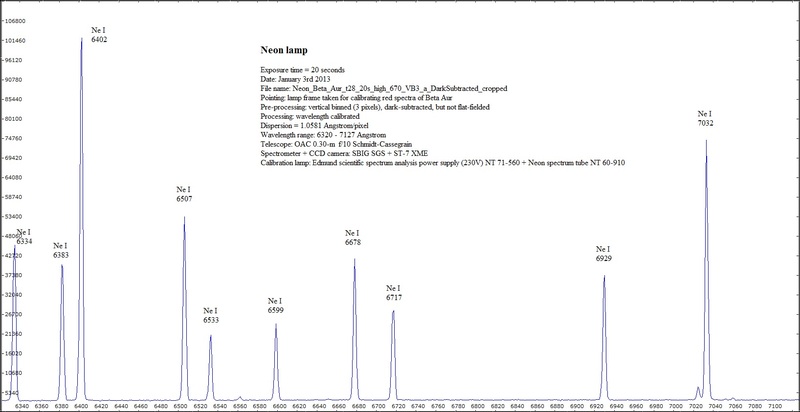 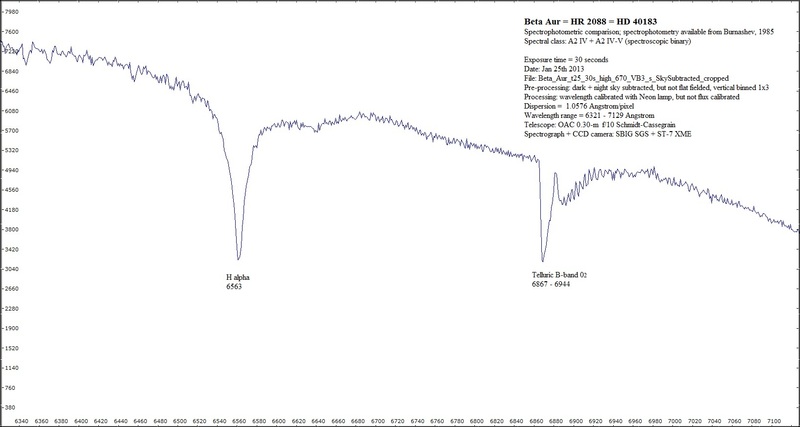 At OAC we have realized a library of low dispersion stellar spectra named OAC-LSS, by means of the DSS-7 spectrometer. 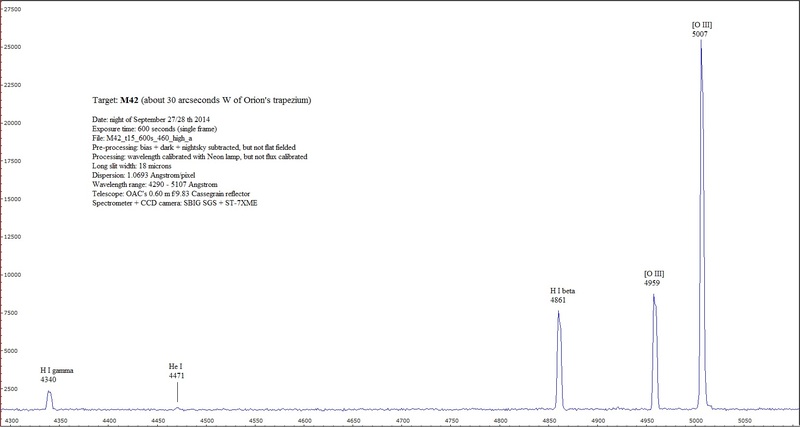 The dispersion of OAC-LSS is about 12 Angstrom/pixel. 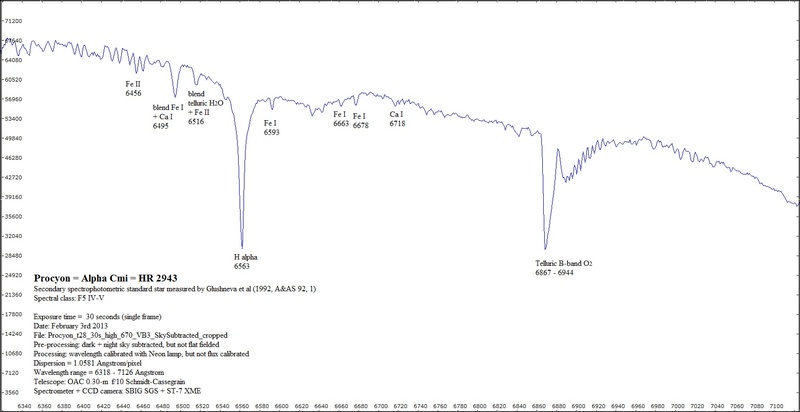 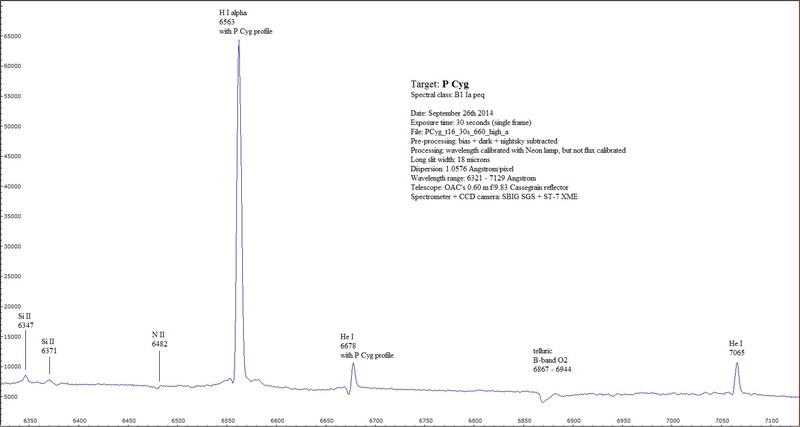 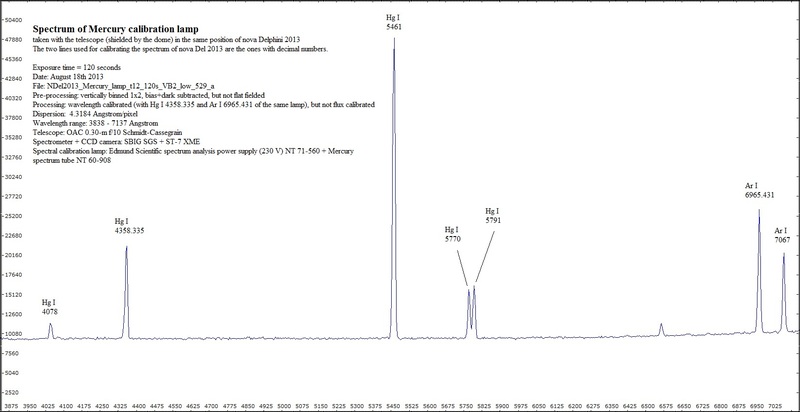 All spectra of OAC-LSS were taken by OAC's director M.M.M. 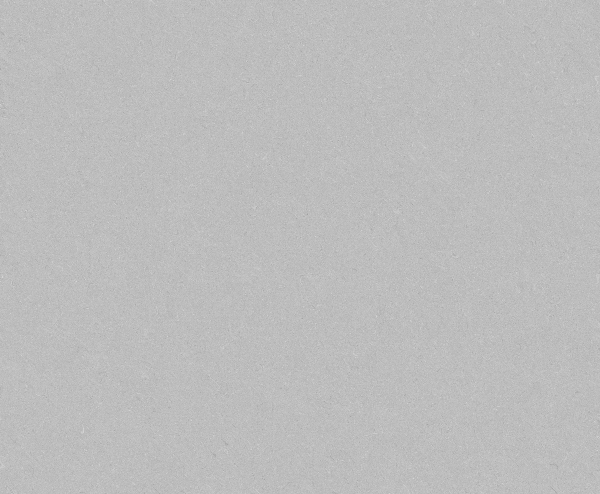 Santangelo with the help of Mrs. M. Pasquini. 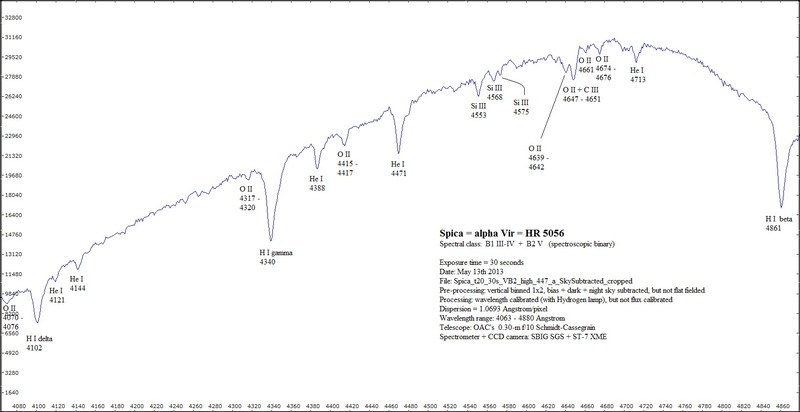 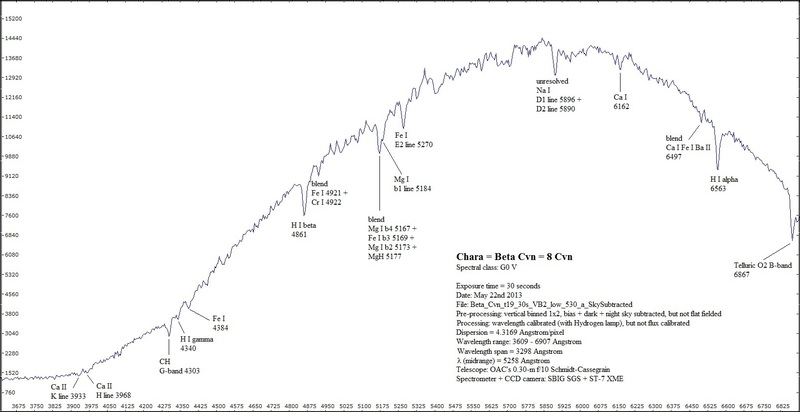 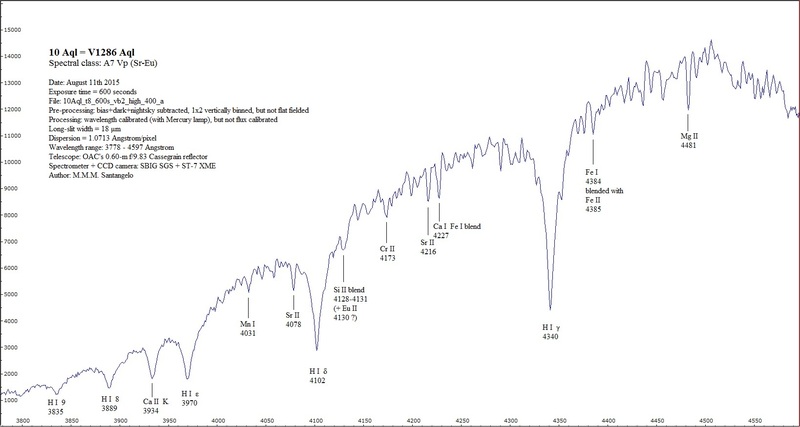 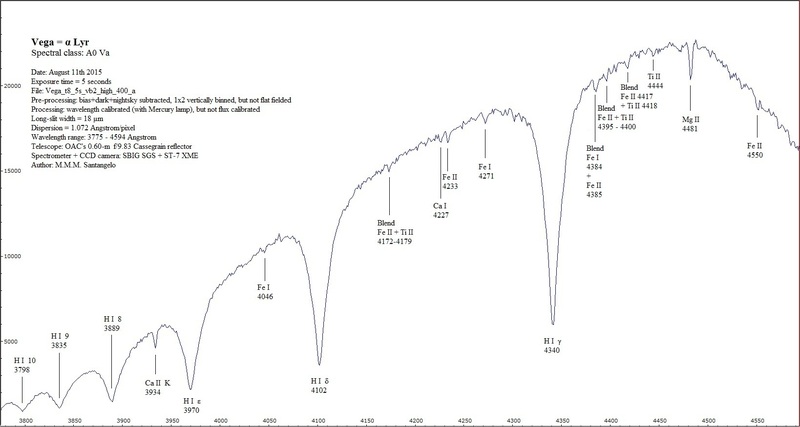 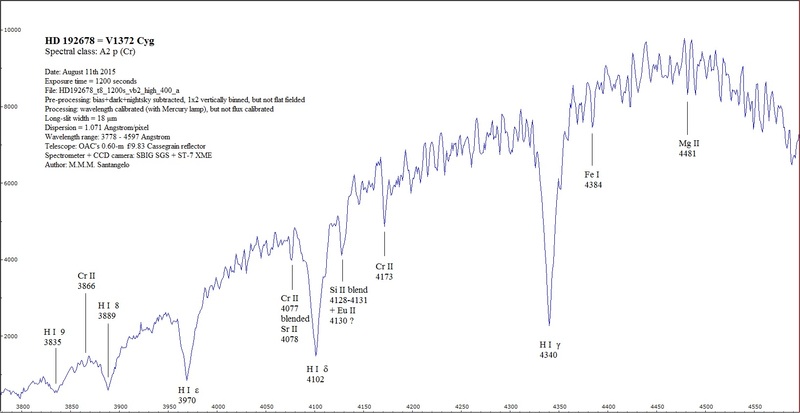 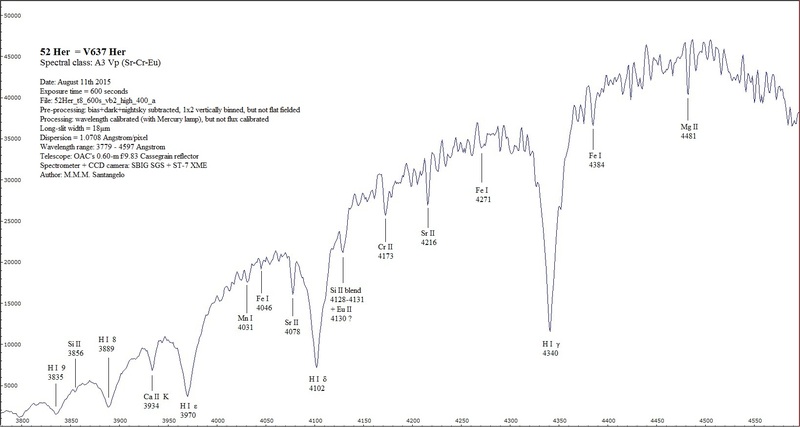 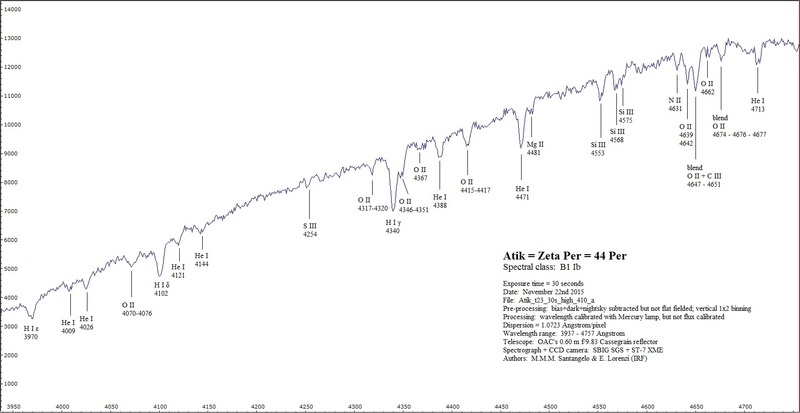 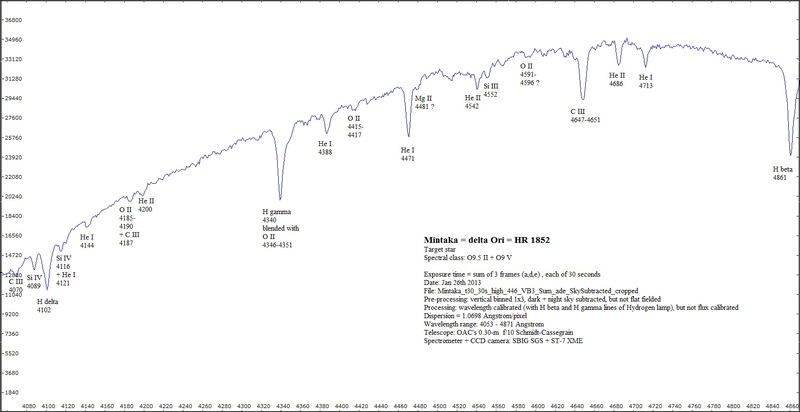 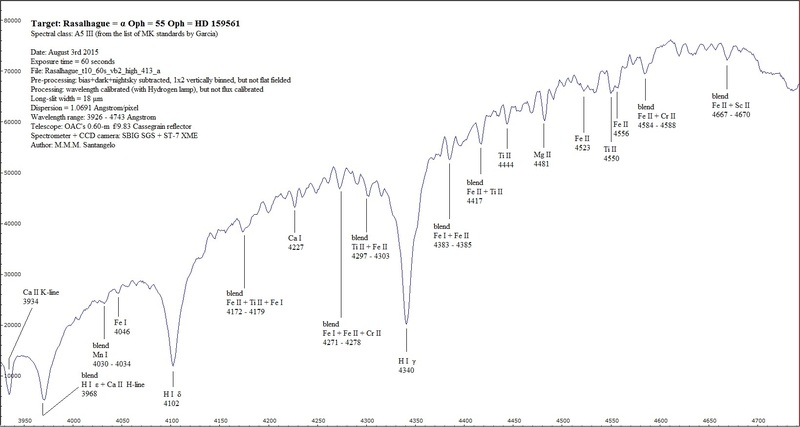 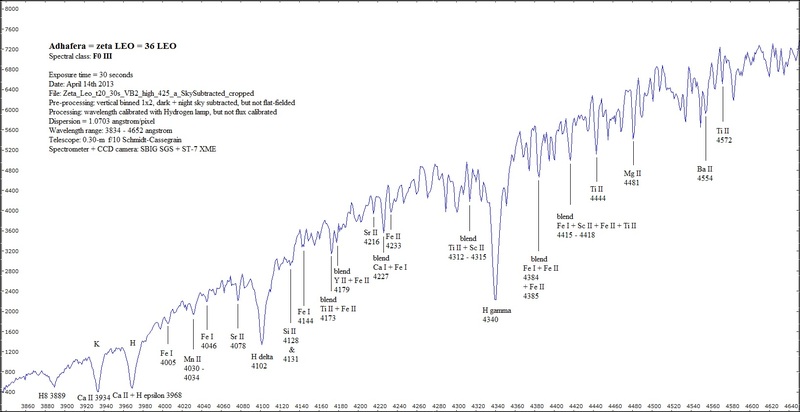 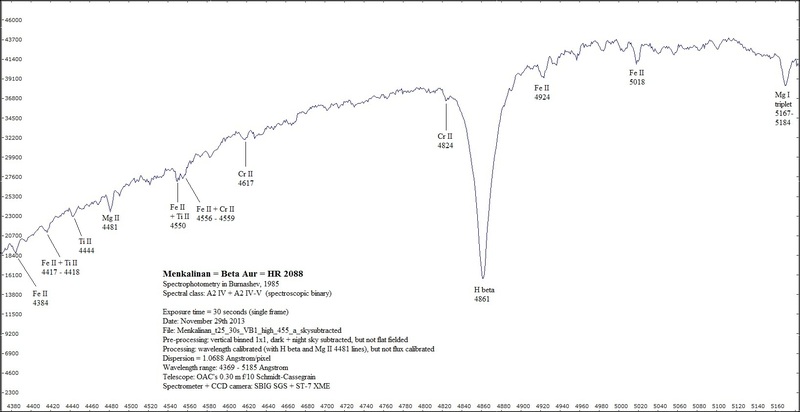 The spectroscopy of variable stars can give us many information about the nature of variable stars: especially if it is performed almost simultaneously to the photoelectric photometry. 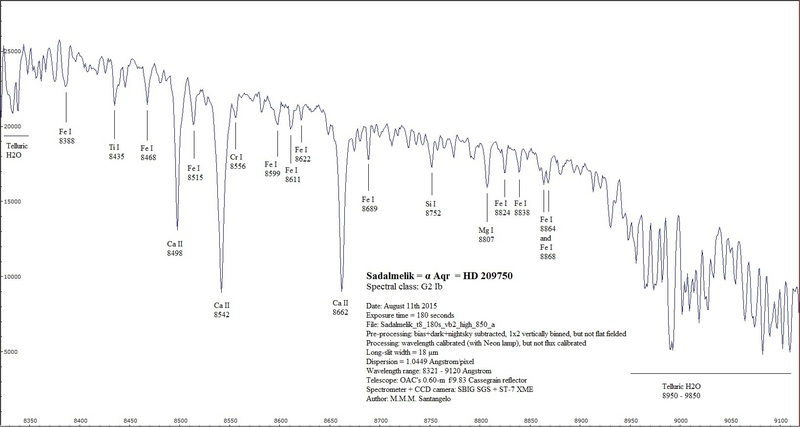 At OAC we are interested in CCD spectrography of variable stars too. 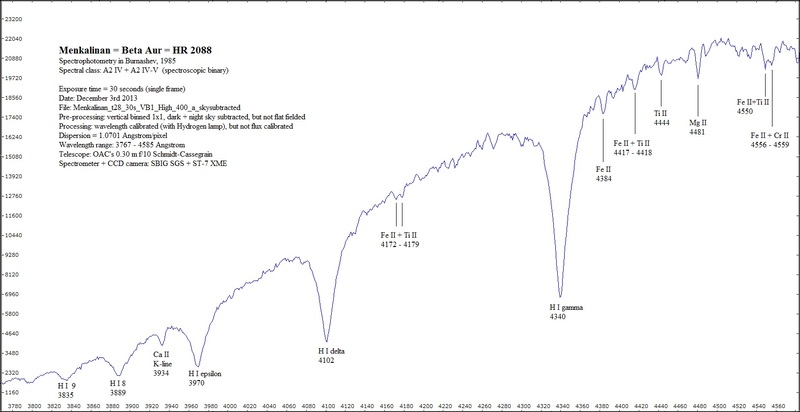 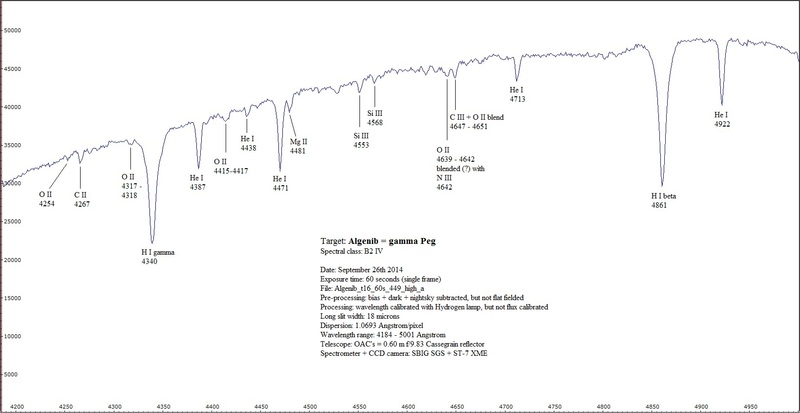 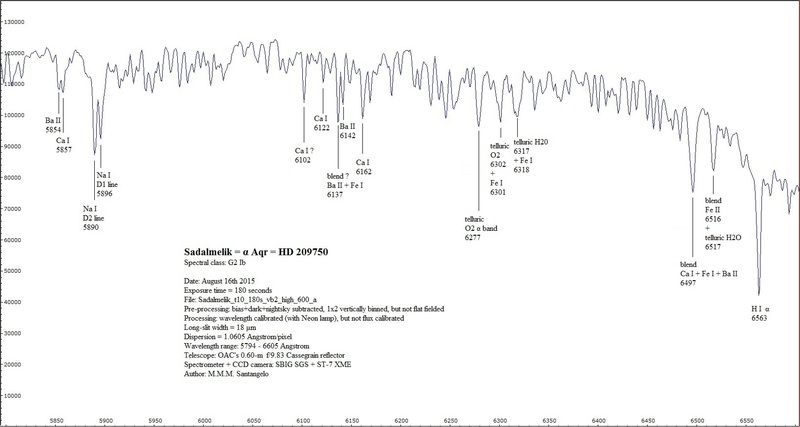 In the following lines there is a link to a sub-subpage about our CCD spectrography of variable stars.